"Discover Easy Tips and Techniques That Will Increase Your Bottom Time By 10% Or More"
Do your dives never seem to last long enough? Is there anything more frustrating than having to turn back just as you spot something really exciting? I remember the moment I decided I needed to learn every single thing I could about air conservation. I had been down around forty minutes when out of the corner of my eye I saw the other divers gathered around a coral head in the distance. I didn't know what they found and I anxious to go and take a closer look. Then I glanced at my tank and I could have cried, the gauge read 800 psi. My bottom time was over, I needed to turn back and head up. Turns out I missed a shark sleeping under the coral head! Are you missing out on the extra dive timethis report can give you? Sometimes In Diving You Only Get One Chance. Right after I missed my one chance at seeing the sleeping shark I swore I was going to make sure it did not happen again. Since then I have researched and experimented myself in real life situations. I discovered lots of tips and hints for making sure I get the most out of every dive, some of them quite surprising. I have since improved my average bottom time by well over 10%. No longer do I have to cut the dive short. In fact, I am usually one of the last divers to get back on the boat. I have even outlasted some divemasters! "Stop Sucking Up Your Air - 13 Steps To Make Your Tank Last Longer"
Researched and Written By Divers, For Divers. the specialist kick that even old hands at diving fail to utilize. I couldn't believe the difference it made. Do you want more dive time? Diving is not something you can be a theoretical expert in; you need to have been there and done it. You must have tried and tested everything yourself, the way I have with each of the strategies covered in this guide. Only then can you be willing to stand 100% behind what you say. I am willing to do that with all of these air conservation strategies. You will find something here to help you stay down longer. Even an extra few minutes could be the difference between a good dive and an extraordinary one. If you have ever lost the chance at something amazing due to an air shortage or even if you just want to get the most out of every dive, grab a copy of these tips today. Because we all know; too much time spent diving is never enough. This is NOT what you were taught in your scuba certification class. That taught you the technical aspect of diving such as how pressure affects our body, the composition of the gas we are breathing, etc. I'll leave that aspect to the training agencies. This is the 100% practical real life side of diving. It's like having a down-to-earth friend answer all your questions and give you advice. There is only easy to understand and straightforward advice. Throughout the report, I give you my real life experiences and examples in all types of situations. You can learn from my experiences - and my mistakes. The report is written in plain English - no complicated formulas or technical jargon here. So start getting the most you can out of every dive. 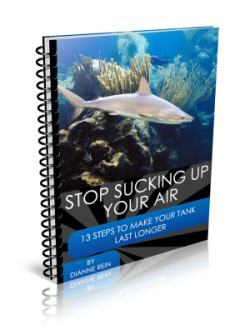 Get your copy of "Stop Sucking Down Your Air - 13 Steps To Make Your Tank Last Longer" now. If you're not completely satisfied with your progress and confidence level, I will give you a full 100% refund. I stand behind my materials completely and know you'll be very happy with the content and, more importantly, the results. in the first 90 days for a full refund. You just can't lose on a deal like that! However, that is not all that is included in this Special Report. Yes, Dianne, I want "Stop Sucking Up Your Air - 13 Steps To Make Your Tank Last Longer" the Special Report full of tips and tricks to make my tank last longer. I have read and agree to the legal disclaimers below. Click on the "Buy Now" button below to have the report delivered instantly in an an ebook (pdf) format for this one time special offer of only $9.95. After your order you will be redirected to a page which contains the download link so you can immediately download the report. You will also receive an email that will contain the download link for the report. * Every effort has been made to accurately represent this product and its potential. Please remember that each individual’s success depends on his or her background, dedication, desire and motivation. As with any endeavor, there is no certain guarantee of success. You will also receive 2 Special Bonus Reports.. If you start to feel anxious or close to panic, what usually happens? Quick breathing, right? This is usually true both out of the water or under water. And if you are diving, this is one sure way to blow through your air quickly. We will show you how to deal with those anxious feelings you may be feeling underwater and how to keep that panic from surfacing. We will clearly outline what steps you can take before you even get in the water so you will feel more confident and less anxious. And, most importantly, we will outline what you need to do if you are underwater and start to get panicky. It could mean all the difference. This is a report you don't want to miss. If you ever wondered what was the correct thing to do on a dive - don't wonder any more. You will discover real life dive etiquette so you will look like you know what you are doing - effortlessly. Remember, this is the 100% real life practical side of diving. This report was written by divers, for divers. You will learn from our experiences and our examples. So don't have to cut another dive short. Learn how to wring everything you can from your next tank with "Stop Sucking Up Your Air - 13 Steps To Make Your Tank Last Longer". 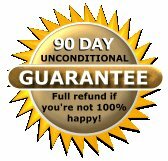 Try it risk free - if for any reason you are not satisfied we have an iron clad money back guarantee for a full 90 days. Just email me with your receipt and your money will be refunded. No questions asked. So start increasing your bottom time on your very next dive. Order your report now for this one time special offer of only $9.95. After your order you will be redirected to a page which contains the download link so you can immediately download the report. You will also recieve an email that will contain the download link for the report.